I was trying to integrate GatherContent module in Sitecore. By the way GatherContent is a collaboration tool where content is drafted, reviewed, analyzed and approved. After approval one can use this data in Sitecore. It’s pretty simple module. Just download, install and configured it. But after configuration, when I click on Test Connection- I was expecting either Pass or Fail result, but unfortunately I received error - "The remote server returned an error: (500) Internal Server Error." I googled this GatherContent error for but was out of luck. So I tried to fix it with no directions. I started my investigation from configuration values in GatherContent item at “/sitecore/system/Modules/GatherContent”. Just to make sure, I filled same configuration values in another Sitecore instance and it was working fine. Now I was sure that it was my Sitecore project specific instance issue. Message: The remote server returned an error: (500) Internal Server Error. This error gave me next pointer where I decided to decompile the "GatherContent.Connector.Website" DLL using "JetBrains dotPeek" tool. I checked the code of Run() method in "GatherContent.Connector.Website.Commands.TestConnection" class as mentioned in above error message. 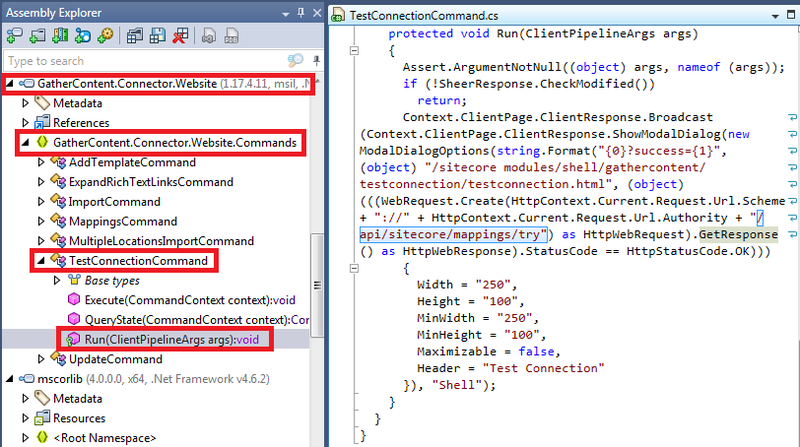 As highlighted "/api/sitecore/mappings/try" is called by Run() method to check the HTTPStatus code. So this call is my next direction to scrutinize. When I tried to access "http://sitecoreinstance/api/sitecore/mappings/try" from browser, I received error as "The controller for path '/api/sitecore/mappings/try' was not found or does not implement IController." Till this point it was clear that as GatherContent is unable to find "/api/sitecore/mappings/try", that’s why reporting error "The remote server returned an error: (500)". 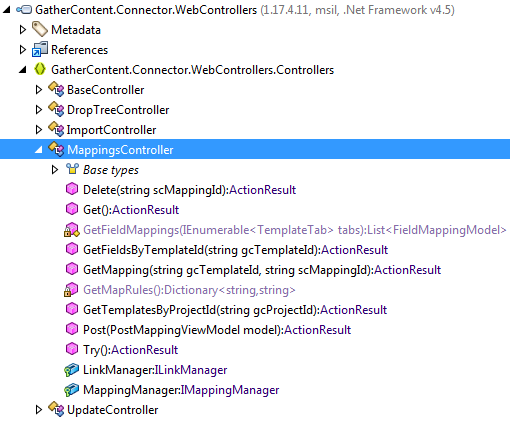 Next I decided to define all the controllers routing in Sitecore MVC project used by GatherCOntent. Build and publish this project. Greattt, if you are reading this line, it means you are able to solve the issue which was not available on Google and GatherContent helpcenter. I hope you like this Sitecore GatherContent investigation. Stay tuned for more Sitecore related details.